Women from St. James Trinity have been making quilts for Lutheran World Relief (LWR) for over 40 years. Some of the quilts are distributed locally, while others travel to distant places. The LWR organization reports that in 2016, a total of 534,144 quilts were distributed to 16 countries in Europe, Asia, Africa and Latin America. 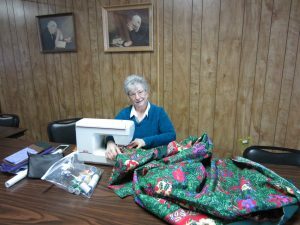 Around 6 to 10 women come to sew quilts monthly in the St. James Trinity basement. They make over 100 tied quilts per year. 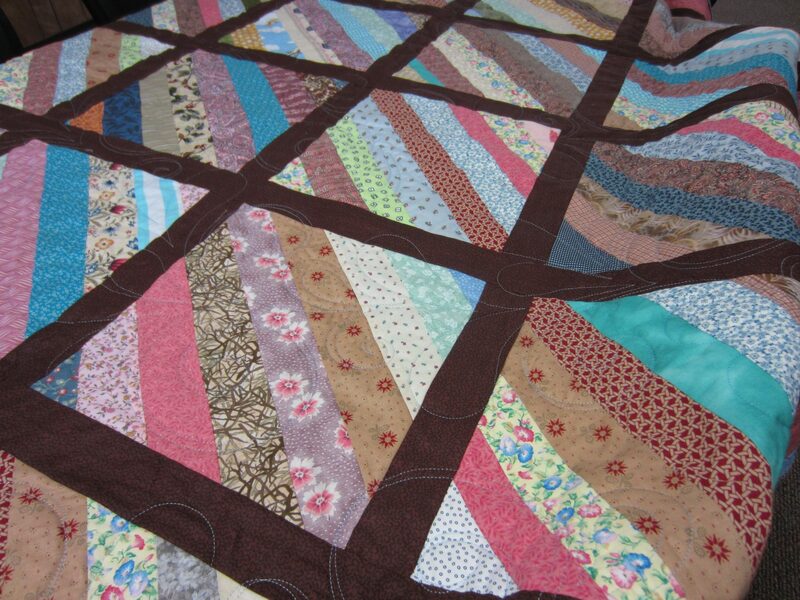 The quilts are created from pieced blocks and donated fabrics. “We give our quilts to LWR, and also locally to people in friendship, not necessarily hardship,” said Opal Kunz, as she busied herself sewing on a brightly colored turquoise floral quilt. The quilters use donated bolts of batting, averaging 28 quilts per bolt. They also use old flannel sheets for batting when making thinner quilts for donation to warm countries. These “cooler” quilts serve as make-shift tents, floor coverings, baby wraps and room dividers. In addition to the tied bed-sized quilts, the women also make baby layettes, health kits and sewing kits for donation. The quilters sew and tie happily as they converse with one another. 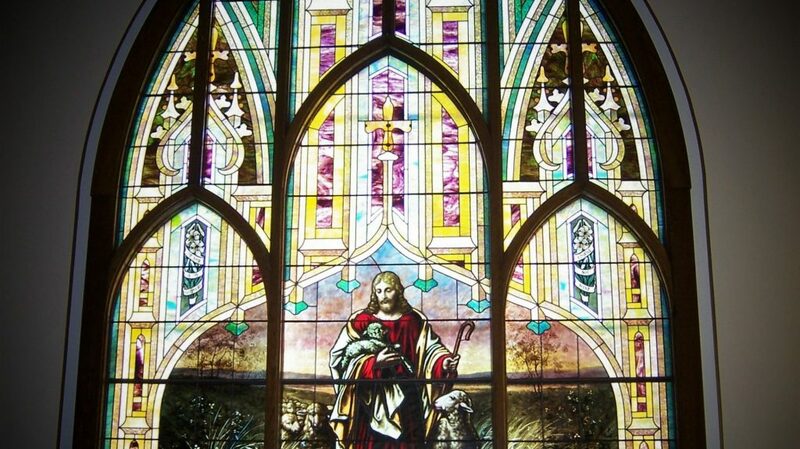 They do this for a variety of altruistic reasons including using their talents for others, providing Christian outreach, and hoping to simply brighten and ease someone’s life. They willingly admit that quilting also offers personal satisfaction. Several suggest that it gets them out of the house in a non-stressful way while also providing camaraderie, friendship and fun. 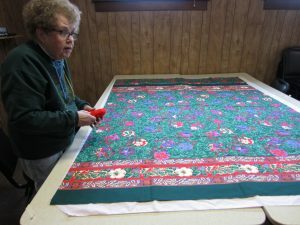 It isn’t uncommon for the women to take the quilts home after a morning of sewing so that they can get more done. Clearly they enjoy the process, the product, and the knowledge that they are helping others. 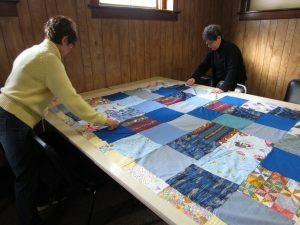 If you would like to be a part of mission quilting, you can donate flat sheets in very good condition, provide funds for purchase of supplies, or come and help in the process. All you need is a willing heart and the ability to cut and tie! All are welcome.